Always considerate. We've worked with the same staff over the years. Beautiful place. Amazing open plan for fun and games after a long day of skiing. I will stay here the next and the next time after that. Thoroughly enjoyed our stay! Would recommend the property and community to everyone who is looking for a quick trip to the mountains. Love the hot tub and view! Will definately use AAA Red Lodge Rentals again! Location was fantastic. Cabin was spotless! Wonderful layout and plenty of room! We were delightfully surprised by the comfort and amenities of the cabin. The location was perfect as we skied 2 days up at Red Lodge and enjoyed shopping and dining in town. It was quiet and quaint and we look forward to visiting Red Lodge and staying at these cabins in the future! I didn't really have to use the team for anything other than the courtesy call. Wonderful stay and the eclipse was perfect in the sky light. Can't wait to come back. Your team was very quick with email responses and informative. We had a great stay at Uppa Creek. The property was beautiful and the cabin had all the amenities to meet our needs. Our family's vacation in Red Lodge Montana was a great experience with long lasting memories! We are very happy with our destination choice and hope to return soon! Working with the team of AAA Red Lodge Rentals was wonderful. They responded immediately to my emails and phone calls in helping secure a rental. It is the perfect size for a family as well as very cost effective. For the price of a hotel, we got our own place, two bedrooms, nice kitchen stocked with everything you need, two sitting areas each with a TV, and our own private hot tub. This was our first family ski trip and the cabin was perfect for the 4 of us. The view is amazing. 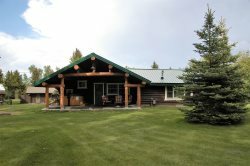 The cabin is close to downtown red lodge and about a 20 minute drive to the ski resort. The cabin was full stocked clean and quiet. Only recommendation is a new queen sized bed. We loved every minute of our trip!! We only called on one occasion and the person who answered was very friendly and helpful. Working with AAA Red Lodge Rentals has been nothing but a great experience! We look forward to our next visit to Red Lodge and staying with AAA Red Lodge Rentals again! The couple of different gals I have dealt with at AAA Red Lodge Rentals were very helpful, extremely nice, and very welcoming!! Both times we have stayed at a AAA Red Lodge Rental house we were very pleased. The people at AAA Red Lodge are very nice and the homes are very clean and accommodating! I never directly worked with anyone, but every thing was smooth sailing from the time of booking to when we checked out! We enjoyed our stay so much! It was a perfect location for weekend birthday get away. Excellent. Betty did the calling and booking. Calls were quickly returned and questions answered. You know, we kind of stumbled upon this rental due to our family deciding to bring out Siberian Husky along this trip, so we looked for pet friendly and found Sweetwater. We cant wait until next visit dog or no dog, we will check for SW availability! Excellent communication before, during, and after our stay. Thank you for letting us know when the remainder payment was due, how to enter the unit upon arrival, and who to call if we needed further assistance. A few months prior to our stay, I called your office so I could do a "drive by", just to familiarize myself where the unit was located in town. The staff member was willing to do so, even though I know you are protective of the guests currently occupying the townhome. Thank you for allowing me to do this! Excellent location, very clean, and super comfortable -- will definitely stay again. It was absolutely perfect for our family of eight to enjoy Red Lodge over Christmas. Thank you so much! I called to speak with one of the team members and my questions were quickly answered. This was the second time using AAA Red Lodge Rentals and we will definitely use your services again. Both times it has been great service and both rentals have been beautiful. Everyone we talked with was very helpful in answering our questions and helping plan our stay at Red Lodge! We loved our time at the Uppa Creek cabin. We were able to relax with our family and enjoy the beautiful scenery. We hope to return for another stay sometime soon! Outstanding service! Perfect home fir our family ski trip to Red Lodge! Truly something fir everyone of all ages!!! We had a newborn to 81 year old in our family.